Hillary Rodham Clinton speaks at an event to discuss her new book in Washington on Friday. If you were at a dinner party and the woman seated across from you was a wealthy, white, well-educated, liberal-to-moderate Democrat, it would be fairly safe for you to assume she supported gay marriage. But if that woman were Hillary Clinton, you’d have been wrong — at least until March 2013, when Clinton publicly announced her support for gay marriage. At least, Clinton would like us to believe she hadn’t supported gay marriage before. In an interview with Clinton on Thursday, NPR’s Terry Gross repeatedly asked the former secretary of state when and how her views on gay marriage had “evolved.” Did Clinton privately support gay marriage for years but wait to express that view until she perceived the politics favored it? Or did her personal view change only recently? Clinton told Gross that, like many Americans, she had rethought the issue, and resisted the implication that her personal beliefs on gay marriage had differed from her publicly stated views. Rather than trying to read Clinton’s mind, we can look at the views of the Americans who are most like her. No woman, of course, is exactly like Hillary Clinton — no other woman has been a secretary of state, a U.S. senator and a first lady. But those private citizens who share the most in common with Clinton were well ahead of the curve on gay marriage. I estimate that somewhere between 75 percent and 90 percent of them supported gay marriage as of 2008. The way I came up with these figures was to look at individual-level voter data from the 2008 exit polls, specifically from the three states — California, Arizona and Florida — that voted on gay marriage ballot initiatives that year. This data allows us to understand, with quite a bit of detail and precision, what demographic and political characteristics predict a voter’s likelihood of supporting gay marriage. (In the past I’ve used this technique to estimate support for gay marriage in every state.) 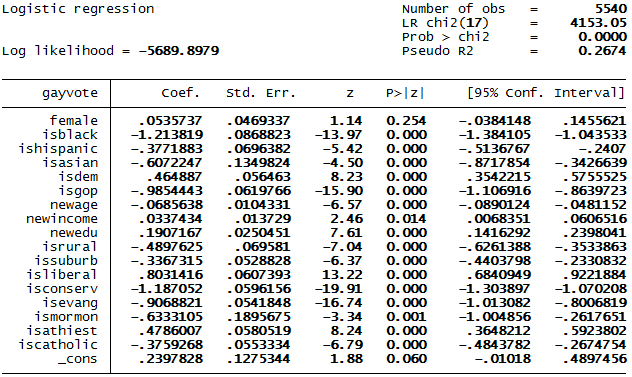 In the output below, from a logistic regression analysis on this data, positive coefficients are associated with an increased likelihood of supporting gay marriage, and negative coefficients with a reduced one. if religious, is a non-evangelical Protestant, rather than an evangelical, Mormon or Catholic. Almost all Clinton’s characteristics would predict a higher likelihood of supporting gay marriage: She is Democratic, female, a non-evangelical Protestant and in the exit polls’ top categories for household income and education. The only factor that would negatively predict support for gay marriage is her age: Clinton turned 60 in late 2007. But a voter’s ideology in the exit polls is based on how she chooses to define herself — and Clinton has sometimes avoided describing herself as a liberal (instead, she called herself a “modern progressive” during a 2007 debate). Would she say “liberal” or “moderate” if asked privately in an exit poll where “progressive” is not an option? Whether Clinton’s residence is urban or suburban is also up for question. Before Bill Clinton’s presidential run, the Clintons lived in the Governor’s Mansion in Little Rock, Arkansas, which would be considered urban. While he was president, the White House in Washington, D.C., was their sole residence until 1999, when they purchased a home in Chappaqua, New York, in suburban Westchester County, and began filing their taxes from there. The Clintons have also maintained a home in Washington, however. So we’ll run the numbers two ways: First, for women who are liberal and urban, and second, for women who are moderate and suburban — with both groups matching Clinton’s demographic profile in all other respects. The regression model estimates that about 90 percent of liberal, urban women like Clinton supported gay marriage as of 2008. Meanwhile, about 75 percent of moderate, suburban women like Clinton did so then. The majority of women with this profile supported gay marriage long ago. I estimate, for instance, that about 75 percent of liberal, urban, Democratic women who otherwise match Clinton’s demographic characteristics did so even in 1992. And support among moderate, suburban Democratic women like Clinton rose above 50 percent shortly after her husband took office in 1993. Those figures might seem high. But there were some people who supported gay marriage in the early 1990s — about 25 percent of the U.S. population, based on the trend from national opinion polls. These were just the sort of people likely to be among that 25 percent. But perhaps Clinton should be compared to other politicians and not to private citizens. President Obama was also slow to announce his support for gay marriage. So were most Democrats in the U.S. Senate. As the Atlantic’s Conor Friedersdorf points out, politicians who changed their position on gay marriage risk being criticized however they explain the shift. Either they look like they weren’t willing to stand behind their convictions or they admit to holding a position, until very recently, that many Democratic voters now regard as wrongheaded and even bigoted. A third option, also fraught with complications, might be to embrace a distinction between private views and public positions for elected officials in a representative democracy. Nonetheless, it’s fair to be suspicious of politicians like Clinton who imply that they were just regular Americans going along with the tide. 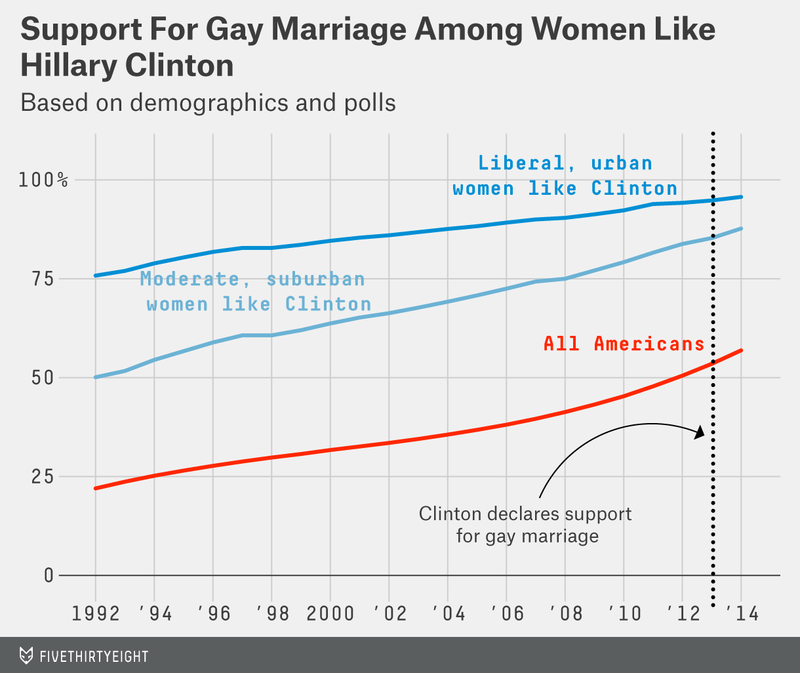 The median American came to support gay marriage only recently — but the Americans most like Clinton did so a long while ago.